This passage is of course of great interest to rhetoricians. What is the definition of “persuasion” in this passage? And if we return to the Twitter exchange above, how is that definition of persuasion linked to the idea of healthy conversation? Warzel and Starbird seem to agree that the use of the quote tweet is not a healthy approach to debate and that there is little persuasion involved. Warzel even indicates that Twitter’s design decision to implement the quote tweet in 2015 is a direct contributor to unhealthy interactions on Twitter. 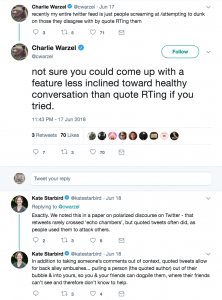 I am quite interested in Warzel’s choice to link Twitter’s design decisions to the shape of our debates, and I am equally interested in Starbird’s discussion of what the quote tweet tells us about how debate and persuasion happen (or how they don’t). But instead of asking if the quote tweet sparks “healthy” debate, I’d like to consider whether it should be seen as a symptom of unhealthy infrastructures. To do so, I think we should understand the quote tweet as part of a longer history of rhetorical strategies, particularly those used by marginalized people. Those strategies emerge because of some of the deep commitments and ethical assumptions built into our media infrastructures. My recent research has turned to the telephone to understand how abuse and harassment have been dealt with in previous media ecologies. That research led me to the labor of the telephone operator. In early telephony, operators were relied upon for a personalized touch that one couldn’t get with the telephone’s main competitor, the telegraph, a technology manned by men. Luckily, for Ma Bell, women of the late 19th and early 20th centuries had been taught core skills in the classroom as well as in the conduct literature of the time. They were repeatedly instructed to be in the background—to connect the wires. Nan Johnson’s archival research on late 19th and early 20th century parlor pedagogies reveals the extensive advice women received regarding how to be a medium. To take just one example from Johnson’s Gender and Rhetorical Space in American Life: 1866-1910, a book called The Glory of Woman (1896) instructed women to be a medium, to play the role of “the one who listens, manages, suggests and draws out or gives opportunities to others.” Venus Green’s research on telephone operators makes it clear that those at the switchboard were similarly expected to remain in the background, and she also makes clear that this is a story about both race and gender. Operators were almost always women, but switchboard labor shifted from white women to black women in the 20th century, just as automated telephone switches were set to decimate the profession. Recent years have seen a massive amount of historical research from people like Wendy Chun, Katherine Hayles, Mar Hicks, and many others who have tracked these same historical trends in computing. In Programmed Visions, Chun even tells the story of how an African-American computer who dared to think for herself (that is, do more than “just compute”) was seen as a discipline problem (40). Given this history, the quote tweet can be seen as a rhetorical tactic that follows in this tradition of marginalized people maintaining our media infrastructures, albeit with a slight twist. Marginalized people have long been expected to facilitate rhetorical exchange but not to participate in it—to provide the infrastructure, connect the lines, and remain in the background. The quote tweet is repetition of this tradition with a difference, since it is an example of epicrisis, a rhetorical figure that involves quoting and commenting on a passage. Epicrisis means letting the other (man? white person?) speak, but it also means stepping into the fray and providing commentary. Perhaps the rise of the quote tweet isn’t unhealthy but is instead the result of an unhealthy infrastructure that pushes the responsibility for content moderation onto users (and in disproportionate ways onto women and people of color) as well as those working in the digital sweatshops responsible for viewing, sorting, and blocking horrific content (the work of Sarah Roberts, Tarleton Gillespie, and others in the area of commercial content moderation could be the subject of an entire post). The quote tweet is used to great effect by black women like Tressie McMillan Cottom and Roxanne Gay. A twitter user harassing, annoying, trolling—pick a gerund—one of these women may find themselves quote tweeted, a response from McMillan Cottam or Gay accompanying their own remark. What should we gather from these quote tweets? When Stewart et. al. suggest that the quote tweet is not about persuasion, they mean that it’s not about persuading the person quote tweeted. This is perhaps correct. But there are other audiences at play. The target of abuse or harassment can use the quote tweet to expose an unhealthy media infrastructure, one that still asks certain populations to be the medium, to make the connections for others, to ensure that the rest of us can go on our merry way. We would do well to see these situations as evidence that we continue to build unjust and unhealthy infrastructures. In these situations, the quote tweet is a moment when everyone has to witness that labor that has long been hidden, forced into the shadows. These are moments when we realize that our infrastructures have always been built on the labor of those who are instructed to be silent and be in the background. These tweets are actually instructional material, exposing the mechanics of our infrastructure, which requires a great deal of labor that is too often invisible. My recent research into the long, intertwined histories of media infrastructure and harassment suggests to me at least two things about the futures of digital rhetoric. First, the future of digital rhetoric lies in attending to the histories of contemporary digital infrastructures and practices. One of the values of a rhetorical approach to digital media is the deep archive of theoretical tools that help us do this work. Second, I see this research into techniques like epicrisis as part of recent trends across media studies, trends that are interested in both the technical details of infrastructure (code, networks, hardware, software, etc.) as well as the practices that both emerge out of and then reconstitute those infrastructures. In this example, the turn to epicrisis reveals the historical underpinnings of contemporary infrastructures and the rhetorical practices that those infrastructures enable and require. Jim Brown is Associate Professor of English at Rutgers University-Camden where he also serves as Director of the Digital Studies Center (DiSC). His research addresses the ethical and rhetorical underpinnings of computational environments.